On Saturday, Bill Simmons (aka The Sports Guy) tweeted about my NFL Draft blog post, and the result was an influx of his followers. It was a thrill to have the traffic, and many left thoughtful comments and participated in the discussion. Saturday saw quite a nice uptick in traffic. I was surprised how strong daily visits remained on Sunday and Monday. Even on Tuesday, Pacific Northwest-Coast Bias had over 20X the normal traffic, which is great. It appears as though many Sports Guy fans have stuck around. I was also interested in seeing the demographic breakdown of Sports Guy fans. I hypothesized a size-able East Coast Bias for sure due to his love of Boston sports.I also wondered how much love the West Coast has for him. The Sports Guy stronghold in New England is not surprising. However, I was shocked at the gap in the map in the south. 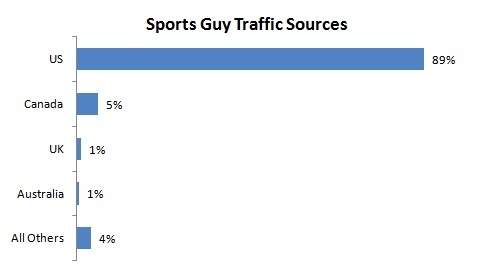 The Sports Guy is underrepresented in a huge section of the country from Texas to Florida. What I thought would be an East-Coast bias at the expense of the West turned out being at the expense of the South. The Northeast coast dominates top states, and the South is way behind. I have several hypotheses for why this could be the case. The South loves college football above all other sports , but the Sports Guy focuses much more on professional sports. NASCAR is another big sport in the South, but Bill Simmons mentioned it once in the past year, and only in passing. Finally, while Simmons bashes the Yankees, he’s still a Northerner, and I can understand why Southerners may prefer a closer perspective. If I’m the Sports Guy, I immediately start devoting more commentary to college football, and swallow my pride and churn out a column on NASCAR immediately. Even if they are not his favorite sports, I know people would love his perspective. Finally, I was interested in Simmons’s international appeal. I was surprised that 11% of his readers came from outside the US. However, most visitors are from predominantly English-speaking countries. The top country without English as the primary language was Germany, which had 25 basis points of traffic. To Bill Simmons’s readers: Thanks for stopping by, and come back soon. Don’t forget to subscribe to the RSS Feed and follow me on Twitter. 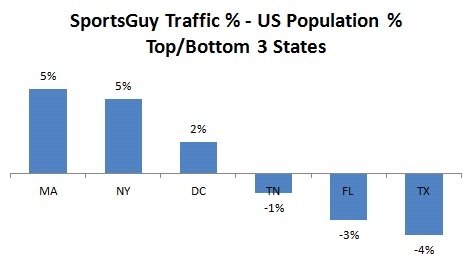 * – the formula for this calculation = (% Sports Guy Traffic – % US Population) / % US Population. This normalizes for small states.